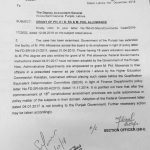 Govt of Punjab School Education Department has issued Notification No. 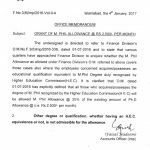 SO (SE-III) 2-16/2007 dated 6th March 2013 regarding Grant of Ph.D and M.Phil Allowance wef 01-02-2013 to the school teachers of Punjab of BPS-17 and above. Ph.D Allowance will be @ Rs. 10,000/- Per Month while the M.Phil Allowance will be @ half of Ph.D i.e Rs. 5000/- Per Month. 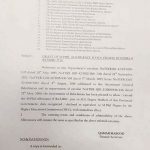 M.Phil or Ph.D Allowance will be granted on acquiring M.Phil or Ph.D degree in school subjects i.e Urdu, English, Islamiyat, Pak Studies, Physics, Chemistry, Botany, Zoology, Mathematics, Statistics, Computer Science, History, Arabic or MCS from recognized universities. Only one M.Phil or Ph.D Allowance will be admissible. M.Phil or Ph.D Allowance may not be admissible to those who have already drawn four/six advance increments on acquiring of M.Phil or Ph.D.
M.Phil Allowance will not be admissible to those who acquired M.Phil during study leave, already drawn two advance increments, pay and two annual increments of the study period (two years). 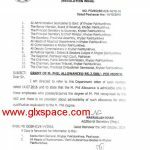 Grant of Special Allowance for M.Phil for Subjects Specialists/ SSS/Headmasters/Senior Headmasters/Principals (M&F) is subject to the condition that the qualification allowance for M.Phil @ Rs. 1200/- PM already admissible to these categories wef 01-09-2007 in terms of Notification No. SO (SE-III) 2-16/2007 dated 24-09-2007 would be discontinued. Dear Syed Zia-ul-Hussain the notification is attached at mine site. You can download the same from mine site. im bs 06 govt employee done m.com and now mphill in commerce is continue. will u please tell me during study leave i am entitled to full pay or 75% or half pay please. Dear Azam, according to the leave rules, study leave is granted for the study of scientific research subjects and it is granted with full pay. m.phil ka jo latest notification hy wo to btaen????????????????????? Grade 17 se lower grades walon ki degrees fake hain kia? sb bkwas ha. we condemn this discrimination. we condemn the decision of punjab gov. 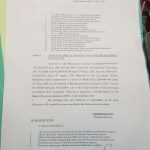 about this allowance admissible only for bps-17 and above. As this allowance pertain to m.phil degree and should not be linked with scales. All teachers working in any scale having m.phil/phd degree should be admissible for this allowance. plz raise your voice for your right. Mam i am working as a computer instructor (BS#17) in FGEI, kindly tell me that is it any sort of M.Phil related allowance is given in FGEI if i do M.Phil in Computer Science. Secondly also tell me about the teaching allowance (Rs. 1000/-) which is given to the FGEI teachers under 2006 notification which is also given to me if got B.Ed? yeh sab bakwas he teachers ko Account Office walon ki tarah (technical/Professional) Teaching Allowance dena chahiy. i am a teacher BPS 15. kya moji M phil allowance mili gee..................? ap kis seat pe ho BS 15 mei???? pleased to read m.phil and phd notification by education deptt govt of punjab.many thanks for this struggle.it is big service to those who deserve and posess the qualification. simple giving remarks oper neche. no matter. 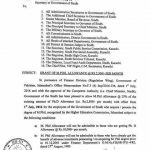 i am from sindh many times email u for same notification of federal deptt as sind deptt has nt given this allowance. try if u find the federal finance letter. MR CHAMAN, WHTS THE IS THIS U ARE SAYING NO MATTER OPER NICHEY??? WHT U SAY WHEN A HIGH QUALIFIED PERSON HAVING M.PHIL DEGREE IS WORKING AS PST???? I KNOW MANY PEOPLE WHO ARE WORKING IN 9 N 14 SCALE WITH M.PHIL. IS IT JUSTICE K 17 N ABOVE KO 5000 N 10000 BT LOWER KO NI ??? WHY ? HOW U CAN JUSTIFY IT??? Any news abt grad-17 of SSTs, 16 for ESTs etc??? wht abt lower scales??? kia unki m.phil ki dgree nakli ha???? ya pher afser shshi ha just??? we condemn this act of discrimination. Why this allowance only for ss and seniors......???? why not for SSE and sese?? ?